America’s favorite food holiday is barreling towards us. Will YOU be ready? We at BarbecueBible.com have created a Thanksgiving menu that will not only thrill your family and friends, but give you an excuse to take the party outdoors to your grill or smoker. Added advantage: this relieves some of the inevitable congestion in the kitchen. “Cider Press”: Inspired by Chimayo, New Mexico, home of superlative apple orchards, this colorful apple cider and tequila cocktail (the rose color comes from crème de cassis) can be made by the pitcher. For an even more interesting cocktail, substitute mezcal for the tequila and smoke the cider with a handheld smoker before combining with the remaining ingredients. Cranberry-Walnut Planked Brie: A starter that takes just minutes to assemble is not a bad thing on a hectic cooking day like Thanksgiving: a round of creamy French brie is topped with cranberry jelly or even prepared cranberry sauce, then studded with walnut halves. It combines two distinctly American live fire cooking techniques—planking and smoking. Serve with, what else, grilled bread. Salt Slab Squash: When the Pilgrims and Indians celebrated the first Thanksgiving, some foods—oysters, for example—were likely roasted on hot rocks. Our favorite rock of all is a thick salt slab. 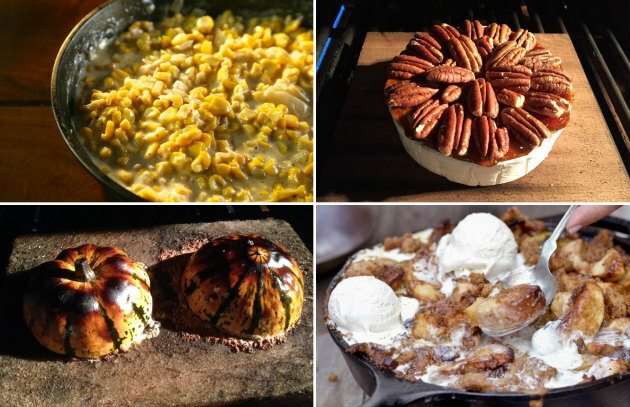 Once soft, you stuff the squash halves with a sweet-salty-savory filling of bacon, pecans, and maple syrup. Grilled Corn Pudding: Nothing says comfort food like creamy nutmeggy corn pudding. This one acquires its smoky caramel flavor from charring the corn on the grill. For even more smoke flavor, smoke the cream using a handheld smoker or in a shallow pan in your smoker. Bacon-Bourbon Apple Crisp: This dessert has been a family favorite since we first tasted (make that devoured) it at the Outermost Inn on Martha’s Vineyard. It’s apple pie’s walk on the dark side, with bacon, bourbon, and wood smoke. Need we say more?